Take the arcade classic Space Invaders and bring it right up to date with a ton of bonuses, free spins and, of course, jackpots, and you've got NetEnt's Cosmic Fortune slot game. Featuring all manner of aliens, objects from outer space and ways to win, this space-themed spinner is as much about entertainment as it is winning. Before you jet off into space, you need to know a few basics. 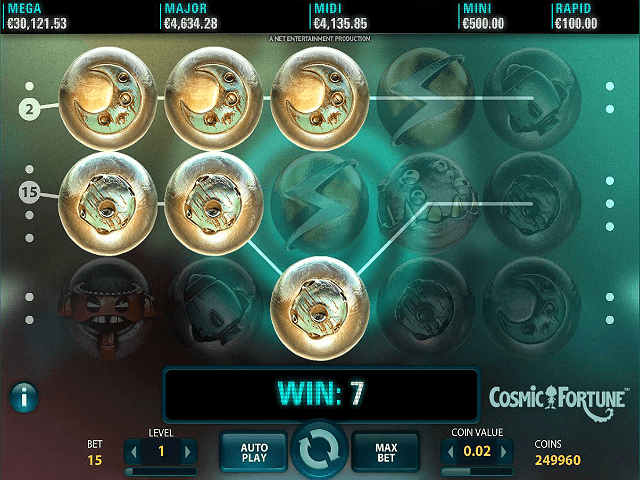 Spinning is a fairly simple affair and, if you read our Cosmic Fortune slot review, you'll find out why. So, if you're ready to learn a thing or two from our Cosmic Fortune guide, let's shoot for the stars! 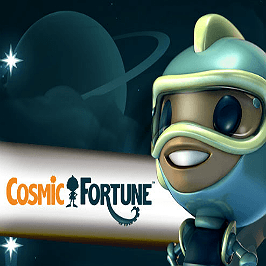 Play Cosmic Fortune for Real Money! 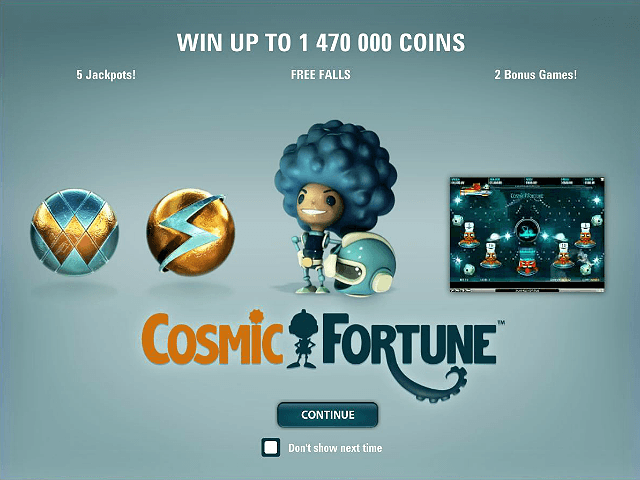 Cosmic Fortune is something of a cross between a video slot and a progressive jackpot game. 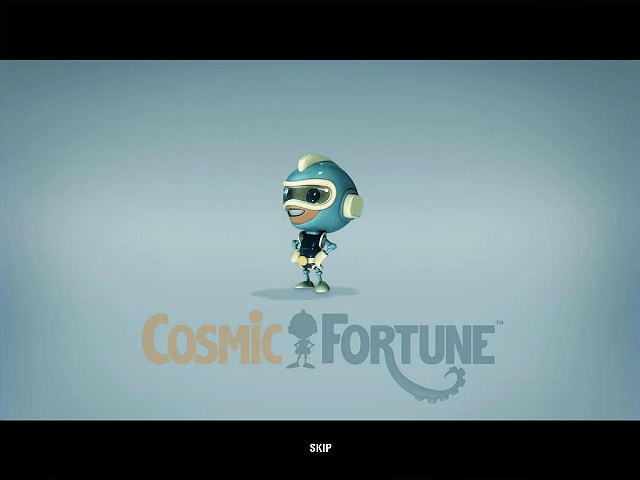 Like many of NetEnt's video game-style slots (think Space Wars and Lucky 8 Line), Cosmic Fortune features a wealth of animations and entertaining features that make it feel much like a video slot. Perhaps the most obvious example of this is the cascading reels feature. Instead of the five reels spinning in place, the balls (each ball contains a symbol) fall into the abyss. As well as offering a slightly different take on the action, the cascading reels allow you to notch up even more wins. When you hit a win, the matching symbols will disappear and in their place a new set of icons will arrive. When this happens, the new set can help to create another win, and so on, and so on. Essentially, this dynamic means it's possible to set in motion a chain reaction of wins from a single spin. However, as much as Cosmic Fortune is about entertainment, it also has five progressive jackpots. To unlock these rewards, you need to activate the 15 paylines and that means setting your bets. In this game, the betting limits range from £0.30 to £75 and for those prices you'll get access to a payout table where prizes range from three times to 1,500 times your line bet. Wilds: This golden ball symbol will appear on reels two and four and substitute for all other symbols except the scatter. Scatters: Three scatters anywhere in view will set in motion ten free spins (falls) with the option to retrigger. Beyond these bonuses, Cosmic Fortune has a Free Falls bonus game where you can win progressive jackpots. As you enter the Free Falls game, marbles will drop from the top of the screen and land in one of two cups: coin win cup, or jackpot cup collector. Any time the marbles fall into the coin cup, you'll receive a small win. However, if you can collect three marbles in the jackpot cup, you'll win one of five jackpots that can be worth five-figures, plus. Although NetEnt's Cosmic Fortune doesn't offer the largest jackpots in the game, its progressive prizes do have some scope to win a spaceship full of cash. 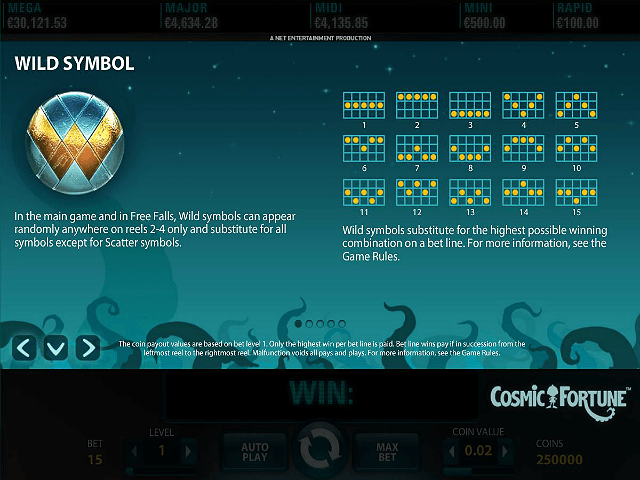 Beyond its progressive jackpot structure, Cosmic Fortune performs very much like a video slot and this makes it a game that can provide the perfect combination of entertainment and money-making potential. Share this Cosmic Fortune Review today! If you like Cosmic Fortune, you'll love these slot titles too!